Our first stop was at the Yardarm Taphouse at Manly Beach. We took a ferry from Circular Quay to Manly & it was so beautiful! There were a few restaurants to choose from but decided on this one after being impressed with their menu & array of choices. I ordered the Salt & Pepper Squid. It was definitely the best I have ever had & I have had my fair share! 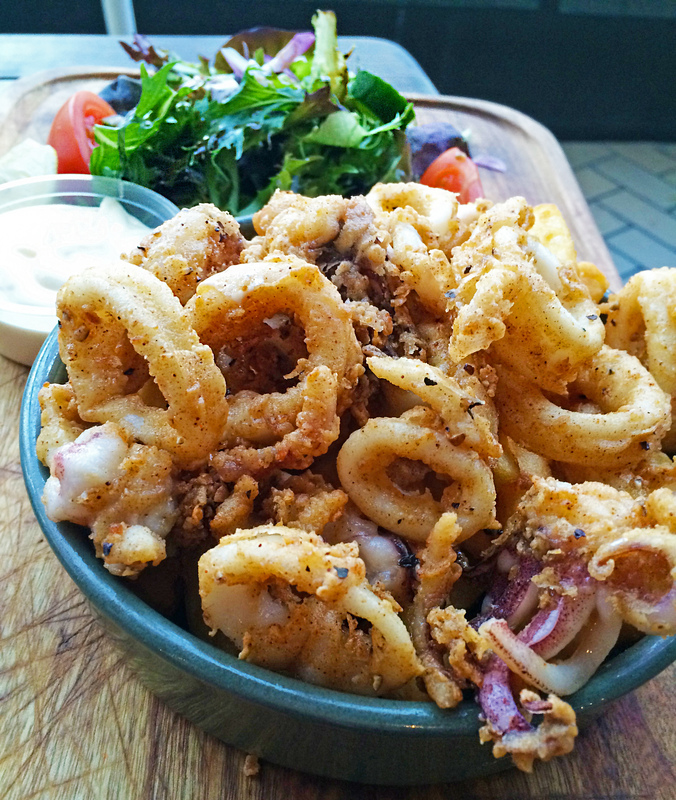 The squid was crispy, tender & well seasoned. There were chips underneath the squid & this worried me at first because I thought they would be soggy but somehow they were super crispy & delicious! The side salad was also nice & aioli was great. Such a delicious & great valued meal! I was so impressed. The next day we visited the Macquarie Centre & came across the Vogue Cafe which was such a cute place. I had heard many good things about it & was so excited to try their very popular drinks. I ordered the Nutella Milkshake & it was AMAZING! Literally a party in a glass. So beautifully decorated with various lollies & a chocolate rim. My favourite were the sour worms ❤ The milkshake itself had a delicious Nutella flavour. I have tried other Nutella milkshakes which have either tasted nothing like Nutella or have been too rich. This had the perfect balance. I was in love. Since we were staying on Campbell street in the city which is also known as ‘Thai Town’ there were many Thai restaurants for us to choose from. Siam House was situated right next to our hotel so we decided to check it out one night. We were so impressed with it’s quality food & value for money! I had the Kana Moo Grob which was crispy pork belly stir fried with chinese broccoli, garlic & oyster sauce. The pork was so crispy and beautifully cooked & combined with the Chinese broccoli it was the perfect meal. It was very spicy though which I did not expect as it was not in the meal description, but it wasn’t too much to handle. I enjoyed this thoroughly! What was also great about Siam House was it’s value for money! Our meals were quite large & so cheap! For two mains, one serving of rice & a drink it totalled to $36! We were amazed. Another great find was Mero Mero in the Queen Victoria Building in the Pitt Street Mall. The place was so busy & packed with people but surprisingly we were served pretty quickly as the staff were so fast & efficient! I had the Mero Mero Chicken Salad which had grilled chicken, lettuce, tomato, cucumber, olives, onion & feta. It was fresh & so tasty! It even came with complimentary bread which I have never seen before. I would have liked more feta as it was only in one clump at the bottom of the salad & there wasn’t much of it, but I still really enjoy this salad & it was great value for $12! 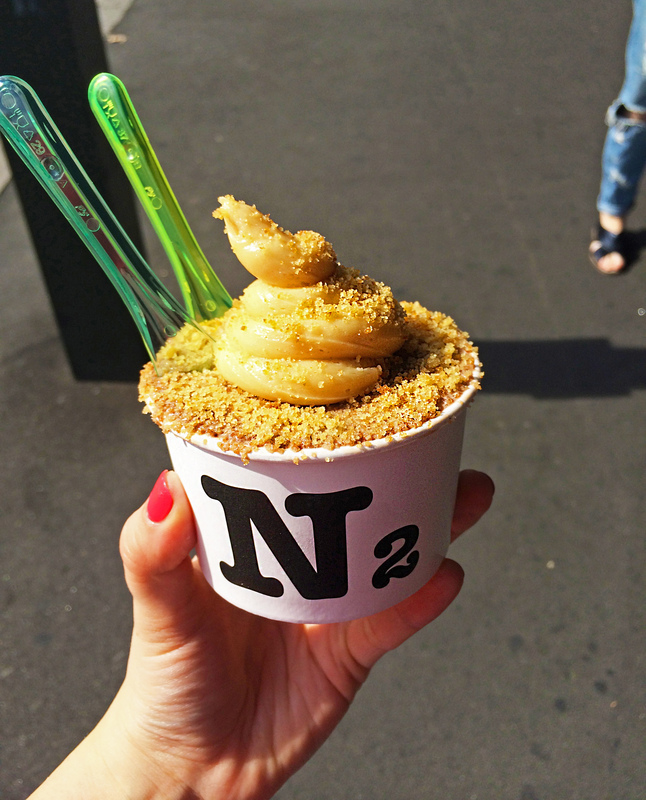 N2 was somewhere I really wanted to visit after seeing many great photos of their delicious ice-cream on Instagram. We visited the N2 on King Street in Newtown & first I thought the place was under construction but soon realised it was only apart of the theme as they use liquid nitrogen to make their ice-cream. It is so cool how you can see them make your ice-cream right in front of your eyes! I tried the ‘Reese Withercakes’ which was SO delicious! It was milk chocolate ice-cream with peanut butter crumbs & peanut butter frosting. I was in ice-cream heaven! The ice-cream was so unbelievably smooth & creamy & accompanied with the peanut butter flavour it was amazing. Only negative is the peanut butter frosting looked like a dog turd but luckily it didn’t taste like one 😛 Our final day in Sydney was my birthday & we celebrated with pizza! This was from the East Bank Restaurant in Circular Quay. Not the best pizza I’ve ever had but still pretty good! 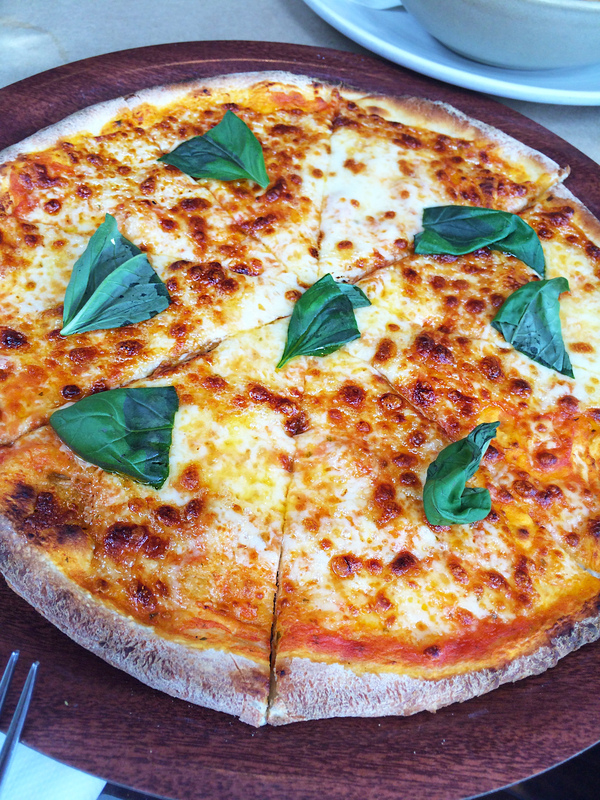 The base was crispy & the simple margherita topping tasted great. I much prefer fresh tomato on pizza however so again, I’ve had better, but it was enjoyable nonetheless.